Always choose a brush with natural bristles as they distribute the hair’s essential oils leaving it looking shinier and healthier. They also make light work of thicker coarser hair. Choose between two styles, the most common of which is the military brush which is held in the palm of the hand. Alternatively the club brush with its rectangular paddle and handle are great for taming very thick or coarse hair. It is worth investing in good kit, which brush you choose will depend on the length of your hair, its texture and the condition of your scalp. Thick and curly hair needs strong bristles, a sensitive scalp fine bristles and long hair longer bristles. Curved brushes are best for styling with a dryer as curve plus hot air equals lift. Using the right tool can make your hair look fuller, healthier and more stylish. Combs are ultimately portable and practical. 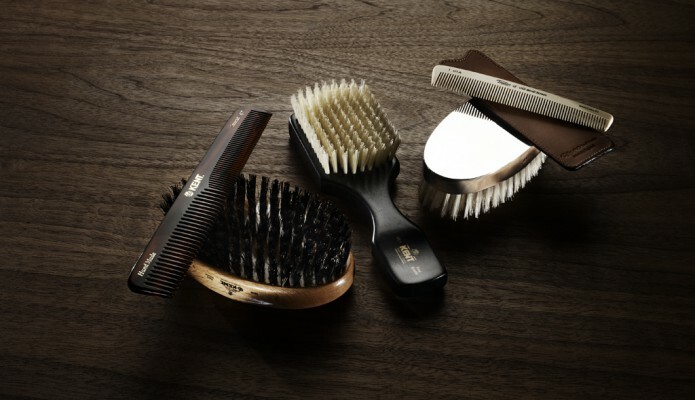 Fine toothed combs can remove dirt, dust and debris, and give hair a smooth finished look. All combs should have some flexibility so if they encounter knots they don’t snag or rip hair. The Kent Hand Made Fine Pocket comb is a great choice as it is hand finished to create rounded ends that never damage your hair or scalp. Lastly the only option for wet hair should be a wide toothed comb. Whatever tool you choose keep it clean, particularly if you have oily hair. Clean your brush or comb by immersing in mouthwash or soap solution and leave to dry face down on a towel.